A long way to go for your kart to not start! Once we did get going, I was well off the pace all day but with karts and drivers falling by the wayside - just keeping going in the final was good enough for 6th. Found out later that the brakes had been stuck on!! Oh well, at least we got a few days away in the Malvern Hills area! Good to be part of an official meeting again and a decent bank holiday crowd watching too! A bit of a washout unfortunately as heat 1 ended stuck in the fence after about 10 metres and heat 2 ended stuck in the middle after about 1 1/4 laps. The meeting was then abandoned due to the bad weather. Would have been a long way to go for just that but we were staying with friends for a long weekend so all was not lost! Started off the back for the heats and final given the lack of competitive action in 2007 to date. Did ok in heat 1 including spinning a temp driver, not great in heat 2 but was on the pace in the final on my first ever visit to this track. Started the Grand National from my blue grade but this did not last long and was abandoned due to fence damage following a crash. The wet summer continued and this meeting was also a washout. Only a fun race took place for the adults so I was able to get a few practice wet shale laps in. Due to there being no white or yellow grade drivers, I ended up starting at the front and leading a few races and results were ok.
Was probably trying a bit too hard at times during this meeting and had several spins before crashing through the fence in the Grand National. Apart from the roof wing and one mirror, all was ok so I made the Grand National restart! Another big meeting at Coventry in front of a good sized crowd. Much better than 2006 and brought the kart home in a respectable position. Due to there being no white or yellow grade drivers, I ended up starting near the front and was on the pace all day. Heat 1 went well before heat 2 produced a 4th place finish and my best result to date. That was until the final, when I managed to get away and despite a yellow flag closing up the grid a 'quick' restart saw me hold on to the lead and record a race win for the first time! This meant that I had to start off the back for the Grand National - I made little progress but the result is not available. Due to the rain, the shale was too wet so we were racing on the Tarmac. One spin all day and results ok. Was probably a bit too cautious at times considering it was my first meeting on wet tarmac. 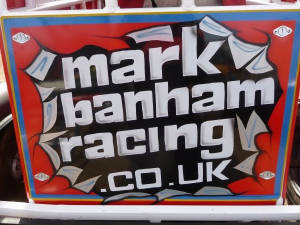 Cold and wet but still a great experience to be racing in front of a crowd at the Foxhall Stadium again. Led the meeting final at the start...did not last long though! A decent learning curve season - with the race win at Stoke (on shale!) the highlight! My win at Stoke has helped to promote me up to the Red grade status!